Think of what foods are conjured up by the word "refreshing", and cucumber and mint are probably quick to come to mind. So after last week's seemingly endless heatwave, you'll thank me for finding this cool, refreshing Minted Cucumber Salad recipe to combat any hot day. (Thank you for sharing Amy!) I'm used to cucumber salads seasoned with dill, and was pleasantly surprised to find that the fresh mint/dried oregano combination tasted perfectly natural in this dish. Although not a big fan of mayo but cognizant that it is a staple in a lot of cold summer salads, I found the Greek yogurt with a touch of mayonnaise a perfect base that was creamy without being heavy. 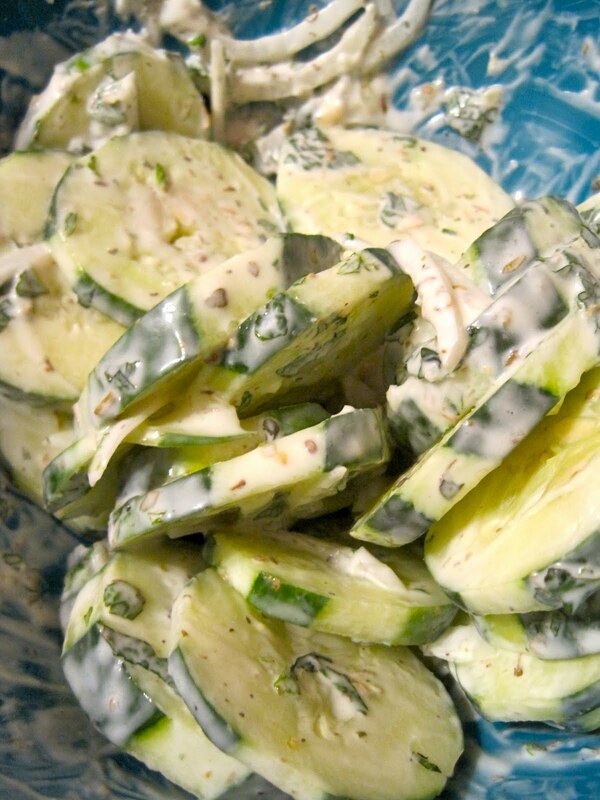 4 small or 2 large cucumbers, peeled, seeded (optional) and cut into very thin (1/8 inch) "moons"
1. Salt cucumbers with 2 tsp salt and put in colander for 20 minutes. 2. Mix mint, garlic, oregano, yogurt, mayonnaise, and red wine vinegar in a large bowl. 3. Just before serving, add cucumbers to yogurt mixture. Add fresh pepper and additional salt to taste.